Germany has delivered onshore wind and solar capacity at a remarkable rate over the last decade, but it now faces a much bigger challenge in developing and connecting large volumes of offshore wind capacity. The German renewable policy has structurally changed power market dynamics which provides an indication of what may follow and of the importance of German energy policy to power markets across Europe. It is shaping up as a key issue in the German election in September. Angela Merkel’s coalition government is under pressure from rising energy bills at the same time it is confronting a significant slowdown in the development of renewable capacity. Renewable energy policy is shaping up to be a key issue in the German election in September. Germany has delivered onshore wind and solar capacity at a remarkable rate over the last decade, but it now faces a much bigger challenge in developing and connecting large volumes of offshore wind capacity. The cost and logistics of this challenge are likely to be the ultimate test for Merkel’s Energiewende. Given Germany’s power market has historically been dominated by nuclear and coal capacity, its renewable targets are the most aggressive in the world by some margin. A 50% renewable production share by 2030 and an 80% share by 2050. 10 GW of offshore wind capacity by 2020. In this article we provide a brief overview of how German renewable policy is impacting the German power market. This gives an indication of what may follow and of the importance of German energy policy to power markets across Europe. A recent presentation from Professor Dr. Bruno Burger of the Fraunhofer Institute for Solar Energy Systems provides some useful factual background on the impact of the increase in German renewable production capacity that has occurred across 2012. 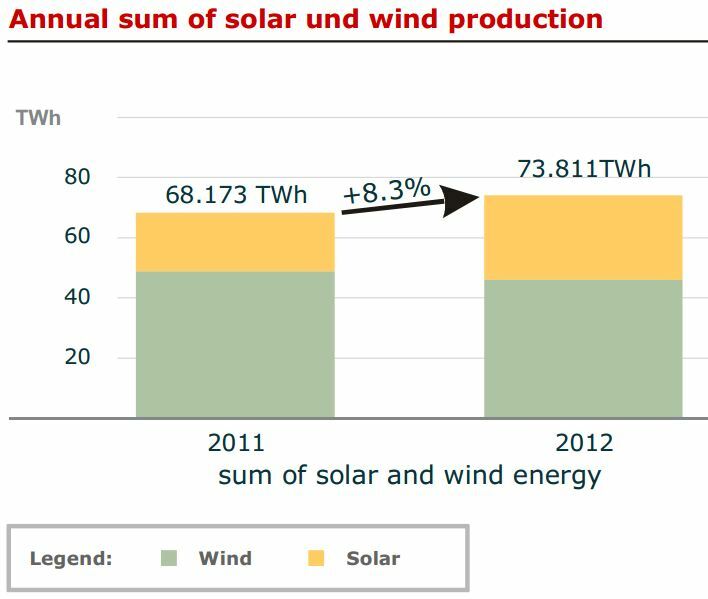 In a year when wind levels were down, the increase in German renewable production has been driven by a 34% (8.1 GW) increase in solar capacity. The impact of this solar capacity expansion on renewable output is shown in Chart 1. The German power market has easily absorbed the loss of the 5GW of nuclear capacity closed in 2011. Compensation for the nuclear shortfall has come from a decline in German power demand and a rise in coal plant load factors. Growth in solar output, weaker German industrial demand and healthy dark spreads, have seen Germany significantly increase exports to its neighbours in 2012 (as shown in Chart 2). The increase in solar production has displaced thermal plant in the merit order, particularly in sunnier peak periods. This has caused utilities in Germany to mothball or close large volumes of gas-fired capacity. A steady increase in the price of gas relative to coal has combined with higher renewable output to crush gas plant load factors, with German coal plant becoming the dominant driver of marginal pricing as shown in Chart 3. Given Germany’s high level of interconnection, these factors have been felt across European power markets. Germany’s flexibility requirement has also increased significantly as a result of fluctuations in wind and solar output. This requirement is serviced to a considerable extent by hydro and thermal plant beyond its borders, e.g. Scandinavian & Alpine hydro production and Dutch gas output. Germany has also relied heavily on neighbouring transmission networks to balance its system given serious north-south constraints within the German network. German renewable policy is clearly a key factor shaping the evolution of the European power market. The German election is likely to have an important bearing on policy direction. In the lead up to polling day on September 22nd we plan to publish several articles exploring the transformation of the German power market. Next up we will look in more detail at the impact of Germany’s renewable production on neighbouring markets in an article to follow shortly.